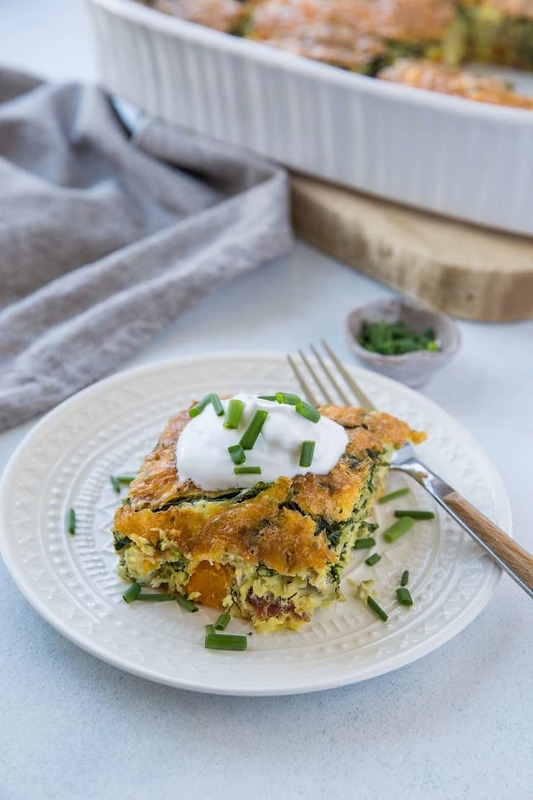 A clean and simple breakfast casserole recipe with butternut squash, bacon, spinach, and chives. This straight-forward low-carb dish is perfect for serving the whole family (or guests) during the chilly fall and winter months. True story: I made this breakfast casserole after posting a photo of my Sweet Potato, Sausage, and Kale Breakfast Casserole on Instagram and got an overwhelmingly awesome response. 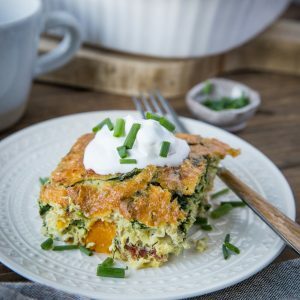 I figured if you all are into breakfast casseroles, heck, that’s one dish I’d love to put on repeat with plenty of variations. 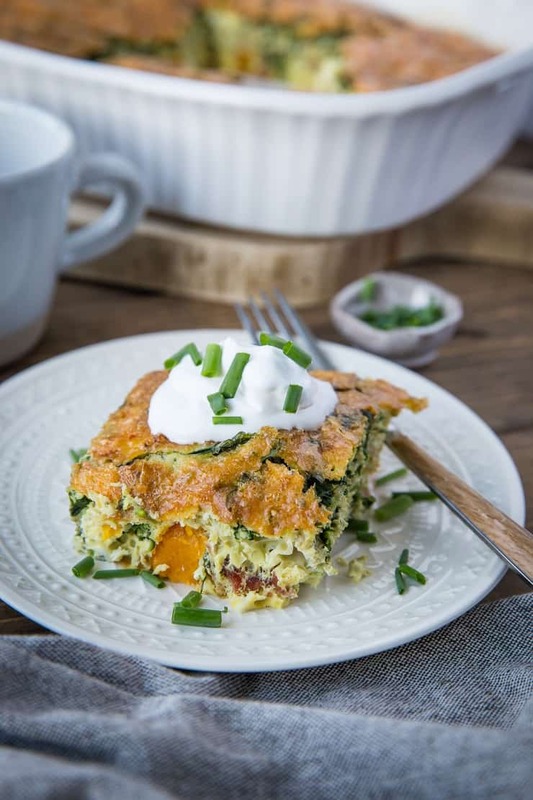 Egg-centric breakfast casseroles are so easy to prepare. All they require is a variety of in-season vegetables, some breakfast meat for the meat lovers, fresh or dried herbs, and eggs. With that basic formula, you can make all sorts of flavors to please the whole family. Because I’m obsessed with winter squash, I used butternut squash in this recipe, along with bacon, dried oregano, and chives. I used a raw aged cheddar cheese on top, but you can also go with your favorite cheese, or remain cheese-less. Let’s dive in to how to make this crowd-pleasing breakfast! Start by cooking the bacon in a skillet. You’ll cook it until you’ve rendered much of the fat and the bacon is crispy. Transfer the bacon to a cutting board to cool – you’ll use the bacon fat in order to cook the butternut squash. Add the butternut squash to the skillet with the fat. Cover it and cook until it has softened but is still a tad al dente, about 4 minutes. Add the spinach, oregano, and chives to the skillet and leave it uncovered while you continue cooking the butternut squash and allow the spinach to wilt. In a bowl, whisk together the eggs until they’re nice and creamy. You can preheat the oven at this point! Transfer the cooked vegetables to a large casserole dish along with the eggs. Use a large cooking spoon to stir so that the vegetables are evenly distributed in the eggs. Sprinkle liberally with cheese, then bake! The cheese will crisp up in the oven, so you can always add more if you want a bit of a goo factor. Allow the casserole to cool at least 15 minutes before slicing into it and serving. Replace the aged cheddar cheese with mozzarella or cheese of choice. Omit the cheese to make this dairy-free and Whole30-friendly. Incorporate fresh herbs – oregano, thyme, and sage work marvelously! Swap the bacon for 4 to 6 ounces turkey chorizo or breakfast sausage. Use kale or collard greens instead of spinach. I enjoy eating the casserole with a dollop of coconut milk yogurt and some chives. You can also do sour cream, avocado, red onion, hot sauce, and any other toppings you love. The way I see it, this is the type of recipe you’ll want to keep on hand during the chilly fall and winter months, especially the holiday season. It makes for an amazing make-ahead breakfast option for your busy workweek and is also great for serving to guests. Preheat the oven to 375 degrees F and lightly coat a large casserole dish with avocado oil or olive oil. Cook the bacon in a large skillet over medium-high, flipping every 2 to 3 minutes, until much of the fat has rendered and the bacon reaches desired done-ness. Transfer the bacon to a cutting board and leave the skillet on the stove top. Reduce heat to medium. Place the chopped butternut squash in the skillet and cover. Cook, stirring occasionally, for 3 minutes. Remove cover and add spinach. Cook, stirring occasionally, until spinach has wilted, about 3 minutes. Stir in the oregano, chives, and sea salt. Chop the bacon and add it in as well. Transfer this mixture to the prepared casserole dish. Whisk the eggs together in a mixing bowl until creamy. Pour the beaten eggs over the vegetables and use a spoon to gently stir to evenly distribute the vegetables. Evenly sprinkle the cheese over the casserole. Bake on the center rack of the preheated oven 45 to 55 minutes, until casserole tests clean (mine takes 50 minutes). Allow casserole to cool 10 minutes before slicing and serving. Serve with plain yogurt (I use coconut milk yogurt), sour cream, chopped chives, and any other toppings you desire. You know, I love breakfast casseroles and I don’t post them enough. What could be better for breakfast during the week or feeding a crowd at brunch? Nothing really! I love the combination of flavors you have in this casserole and I’d love to eat this any time of day! Hi. Can you tell me the nutrition info? Mostly interested in the carbs and fat per serving. Thanks!